It is time for another activity. This activity is not one that would be found out at OEL but is for use here on the Internet. At camp, we vary our teaching styles. Sometimes we have lecture. Sometimes we have exploratory. We usually have a bit of both and a few other styles mixed in there. This activity is an exploratory. 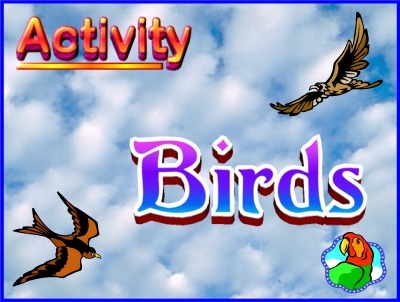 Using your knowledge of the Internet, perform a search using several search engines to learn all you can about birds. In your searching, try to find out 1) what birds eat, 2) what birds are most common to your home town, 3) how often do they have young, and 4) how long do most birds live. As you search for these, you will also hopefully find many other interesting things. To do this search, you can use your favorite search engines or listed below, you will find several suggested search engines. If you click on these links, a new browser window will open so that you do not have to worry about getting back to this site -- just close that new window when you are done and you will come back to this one. If you use your own search engine, make sure that you can get back here when you are complete.